Jesus’ command to make disciples doesn’t have to be complicated. There are many seemingly ordinary things Christians can do to make an impact on those around them. Kevin Halloran spoke with Sean Martin about one such thing: one-to-one Bible reading. You can listen to their conversation, or read the transcript below. This article was originally published on Leadership Resources and has been reproduced with permission. Kevin: Can you start off making the case for one-to-one Bible reading? Sean: I want to start on the personal level. 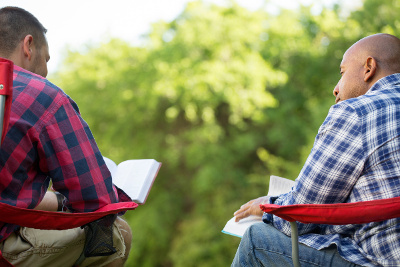 My case for one-to-one Bible reading goes back twenty years to when I became a Christian. The man who led me to the Lord met with me regularly to read the Scriptures, pray, and disciple me. It had an enormous impact on my life and I’m very grateful to God for that. One-to-one Bible reading is something that captured me on the personal level as a disciple of Christ in my early walk and I’ve kept up one-to-ones the last twenty years as I’ve walked with Jesus. To make the case for one-to-one Bible reading, I think it’s helpful in the midst of being in the trenches of life and ministry to go to the 10,000-foot level and ask, “Why do we read the Bible anyway?” I have two core convictions: the Bible is the word of God, and Christ commands us to make disciples. The prime reason I read the Bible with people and would encourage others to do so as well is because we believe, as evangelical Christians, that the Bible is the word of God. We believe that God speaks, and what he has spoken has been written. We believe that the word of God brings life and transformation. When God speaks, things happen. We need to ask ourselves: do I share that conviction? Do we really believe that God is a speaking God and that what he has spoken is written in the Old and New Testament Scriptures? Do we believe that his word still brings life and transformation today? This is why we share the gospel with unbelievers. As we tell people the gospel message, Paul says in 1 Corinthians 1:23-24 it is the power of God to save those who believe, both Jew and Gentile. This is a conviction that underlies all Bible ministry, not just one-to-one. Do you share that conviction? Secondly, we have a conviction about the great commission. In Matthew 28, the risen Lord Jesus says he has all authority on heaven and earth and commands all disciples in every age to make disciples of the nations. One-to-one Bible reading is another way to fulfil the great commission. How do I make a disciple? I can read the Bible with someone one-to-one. Both they and I will grow as disciples of Jesus as God’s word speaks its life into our hearts and as we pray. One-to-one Bible reading is a simple way to fulfil the great commission. One of the reasons I like one-to-one Bible reading is that you don’t have to be a professional pastor, a great evangelist, or seminary educated. What are the qualifications? Three things: 1) Do you love God? 2) Do you love people? 3) Do you love the Scriptures? That’s it. Whether you’re a new Christian, a mature Christian, young, middle age, or old—it doesn’t matter. It’s a simple way to fulfil the great commission. Sit down with someone for an hour a week to pray and read the Scriptures together, and watch God do his work. I’ve seen God do it over and over again as I do one-to-ones and as I’ve been discipled myself. It’s terrific. Kevin: One of the challenges I had when I first started one-to-one reading is focus. There are a lot of different rabbit trails you can go down trying to answer every question someone might have from the text. What is your main focus in one-to-one Bible reading? Sean: I think focus is a key word Kevin because, in some senses, one-to-one Bible reading time is like any meeting. Imagine a work meeting, for example. Many people express their frustrations for meetings because we thought we were going to meet about a certain topic, but we talk about other things and go on tangents. A one-hour meeting turns into a three-hour meeting. If you don’t have a focus, a goal, and some organization, the same thing can happen in your one-to-one. What do you see? What stands out in the passage? What questions do you have about the passage? If Moses was here and you could ask him a clarifying question, what would your question(s) be? We’ll wrestle with those questions together as we look at the text. What is the heart of the passage? What is the main thing the author is trying to say? What is the intent or application of the passage? What was the application for the original audience, and what is it for us today? These four questions give us a focus and drive the meeting. We know those questions will shape our time and we will move methodologically through the questions. It’s a rich time and helps us avoid rabbit trails. Our goal isn’t to answer every single question, but rather to understand the main idea of the text, apply it to our lives, and pray over it. Kevin: What are some of the books you read the most with different types of people? Sean: With an unbeliever, I typically go to Mark’s gospel. It’s a way to meet Jesus as he walks off the pages of Scripture. It’s short, punchy, clear, and narrative with a lot of action. Unlike John’s gospel, there aren’t as many theological abstractions like the “I Am” statements that take a lot of time to explain. I find Mark more straightforward and it gets to the heart quickly of who Jesus is, what he came to do, and what it means to walk with him on the path of the cross. Mark, in my opinion, is the best book for an unbeliever. For new believers, Colossians is my go-to book. It’s like a mini-Romans. It’s a gateway to the gospel and explains the gospel well. In the first chapter Paul reminds the Colossians of what the gospel is and the fruit it bears in faith, hope, and love. The latter half of the chapter makes clear who Jesus is and what he did on the cross, his supremacy as Lord, and the sufficiency of his sacrifice. The following chapters work out the implications of the gospel. What does it mean to put on the new life and leave the old behind? What does living out the gospel look like in married life? At the workplace? I find Colossians to be a foundational book. It’s straightforward and a great book for new believers. With more mature believers, I work back and forth between the Old and New Testaments. I’ll ask, “What’s a book you’ve never read before that we should read together?” Some years ago a guy I was meeting with said, “I’ve never really read Isaiah.” We spend a whole summer working through Isaiah. (We did an overview—we didn’t go verse-by-verse for 66 chapters.) We had a terrific time. Kevin: How do you typically prepare for a one-to-one session? It’s probably different for you since you know these books well. One thing I do to prepare is to tell the person I’m meeting with that this is a two-way street and we are both going to learn from one another. I make it clear that I am not teaching them what Colossians says, it is something we discover together. I make that clear. Secondly, I mentioned the Swedish Method, I give those questions to the person I’m reading with. I ask the same questions too. Over the years, I wouldn’t say I underprepare, but I just do the basics. I don’t pull out commentaries or my old sermons. I just look at Colossians afresh, ask those four questions, and come with a piece of paper and say, “Here are the things I thought of. What did you think of?” This is so the learning becomes mutual. This is very important. The tendency is to study up and show all you got. The purpose shouldn’t be that but to discover truth together. If you’re a full-time ministry worker who learns not to come super-prepared, I think it helps you develop the posture of a learner. We can learn things from brand new Christians. Sometimes new Christians ask me questions I’ve never thought of. I’ve thought, “Wow, that’s a really good question. I’m glad they asked it.” They make me think and work. You can always learn things from God’s people. Not over-preparing is very, very important. Start with a quick catch up, time reading the text, prayer, forty-five minutes working through the text, and a couple of minutes sharing prayer requests, how can we pray the Scripture passage into our lives, how can we pray for our church and the world. One hour, we’re done. Another pitfall to avoid deals with sharing your lives over time. You will be open and vulnerable with one another in this process about how God is stretching you or struggles that you’re having. The relational dynamics between men and women could lead you into areas that could be dangerous. I always encourage men to meet with men and women to meet with women. Whether you’re single or married. Kevin: I think many would agree that one-to-one Bible reading is a great ministry idea, but feel their lives are too packed already with pressures of life and ministry. They might even say, “This isn’t an efficient use of time because I’m only meeting with one person. When I preach a sermon, I preach to the whole congregation.” What would you say to that person? Sean: I would say a few things. First of all, may God keep us from the place where we think we are too busy to make disciples. All Christians are called to make disciples. That’s the command of the Lord Jesus—it’s not an option. One-to-ones are great because it is a simple way to make disciples. You meet with someone an hour a week. Meet them in the early morning if you need. I used to meet with a guy who was a very busy banker. We met every Friday morning at 6 am. It was hard for both of us to get up that early, but that was the only time we could carve out in the week for it, so we disciplined ourselves to do it. I remember many Fridays feeling sorry for myself when the alarm went off at 5:30am to go to the one-to-one. I’d be thinking on the way “this is really early”, but every time once we got going, we said at the end “it was worth it”. It’s always worth it. We’re never too busy to make disciples. The question you have to ask yourself in ministry if you are too busy is: are you letting the urgent overtake the important? We can feel that emails are urgent or texts or meetings, and yes, we need to attend to those things. But what we’re primarily here to do is make disciples. That’s important. I want to make sure that the important overtakes the urgent in my schedule. It’s like going to the gym. You might feel too busy at first, but you have to get yourself going. Once you go and have momentum and are seeing results, you want to make time for it. This verse presents four generations: 1) the Apostle Paul, 2) Timothy, his protégé, 3) faithful men who are able to teach, and 4) others. Once you start meeting one-to-one with somebody, I lay out the 2 Timothy 2:2 vision from the start: “This one-to-one doesn’t stop with you. I’m going to start meeting one-to-one with you, we will do this about two to three months, and at that point we’re going to have a conversation together and I’m going to encourage you to find two people to meet with and read the Bible with.” And what happens is by the third month or so, people are beginning to see the benefit, they’re enjoying it, they’re seeing a change. I ask them to think about one or two people they can have a one-to-one with. That one person starts meeting with two, and I tell them to challenge the people they meet with. Before you know it, the one-to-one that you started has grown exponentially. You could start a Bible reading movement in your church. You could start a Bible reading movement in your high school if you’re doing this. You could start a Bible reading movement in your community. It’s never about just one person. If you bring the training mindset into it, you can have a Bible reading movement all over. Kevin: One thing I’ve heard you mention Sean is that you FaceTime or Skype with guys. If scheduling or proximity are issues, technology can make it very easy. Sean: Absolutely it does. Sometimes it can’t be face-to-face. There’s a young man in ministry in a Central Asia country who wants to talk regularly about certain issues. We read through Scriptures and talk through things regularly. FaceTime allows us to do that. There’s also a young man who moved to Brazil recently who is going through rough lives in life and ministry and again, I just had a chat with him over Facebook Messenger Video. It’s not quite the same as face-to-face (we are physical beings) but still, if FaceTime and Messenger Video are what you have, it is an effective way to shepherd people around the world. It’s terrific. I wouldn’t be able to do it otherwise—letters take a long time! Kevin: Thanks for the encouragement, Sean. And I know you wanted to recommend a resource on one-to-one Bible reading. Sean: I would recommend to anyone who is thinking about one-to-one Bible reading or wanting training to read One-to-One Bible Reading by David Helm. It’s an absolutely superb book—I think it’s the best I’ve seen on the topic and I recommend it to everyone. Sean Martin works with Leadership Resources International (www.leadershipresources.org) training pastors in expository preaching in Europe and Haiti. 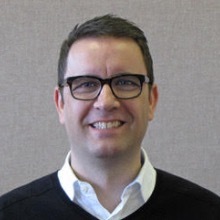 He came to Christ in 1997 aged 28 and served as a pastor in New Mexico and Ireland before joining LRI five years ago. He is married to Natalie and they live in Chicago with their three children.